Lee Greenwood takes his Dewsbury Rams side to York City Knights on Saturday before their final game of pre-season before the Championship campaign begins on February 3. Dewsbury Rams players have a final chance to stake a claim to be included in Lee Grenwood’s squad for the opening game of the new Betfred Championship campaign when they travel to York City Knights for their last game of pre-season on Saturday (ko 6pm). The Rams came agonisingly close to booking a place in the Yorkshire Cup final when they were edged out 20-18 away to Bradford Bulls last Saturday. 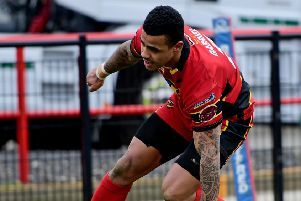 York, promoted alongside Bradford from League One last season, also gave a good account of themselves in their semi-final at Batley Bulldogs on Sunday when they led 18-0 before the home side fought back and a Tyler Dickinson try three minutes from time condemned the Knights to a 22-18 defeat. Dewsbury have shown improvement in each of their pre-season games and a number of players will already figure heavily in Greenwood’s thoughts for the opening Championship fixture away to Rochdale Hornets on February 3. Dewsbury face York City Knights in their first home game and Saturday’s trip to Bootham Crescent gives a final chance for other players to force their way into the reckoning. Tickets for Saturday’s trip to York are on sale at the Rams office priced £13 adults, £8 concessions, with Under-16s admitted free but prices increase by £2 if purchased on game day. The Rams will hold another fans forum next Friday (January 25) in The Royal suite at Tetley’s Stadium with all supporters welcome.